The four lovers of A Midsummer Night’s Dream are reintroduced as YouTubers / vloggers and the performance cleverly incorporates multimedia elements, including video projections whenever the characters are making a video / taking a selfie / calling each other out online. Pre-recorded segments also allowed for the presence of Titania and Oberon, who were not otherwise seen in the production. Written and directed by Art Green, the work centres around An Incident that occurred at a social media meetup and shows the dogpiling and abrupt escalation of harassment that can occur in the online space – perceived moral high grounds and shaming others for their problematic behaviour, the inaccurate twisting of words and stories that can easily become cemented as facts. The four loves are torn apart by the competition for followers and online approval, reacting to news events and offering their opinions based on what will get the biggest reaction from the invisible online audience. Puck’s innocence and outsider perspective cuts through this social media madness, which most of us encounter every day, and the audience is struck again by the familiarity of the awful words and ideas that lose their meaning to the writer when they are typed carelessly into the void. Andy Green, Brodie Shelley, Joseph Wilson, and Maddy Parkinson all gave strong performances, each bringing their own style and sense of vulnerability to the reinvented Demetrius, Helena, Lysander, and Hermia. Ecks gave a powerfully emotional performance as the acrobatic, mischievous titular character of Puck. The layers of meaning and attention to detail in this production were outstanding. Puck treats everything as casual ‘mischief’, reminiscent of the way that people do not realise or acknowledge the harm they do to others, especially in the online space, even when things go too far. As funny as it is timely and poignant, MNTC’s Puck does what all brilliant theatre does – holds up a mirror to humanity at a critical juncture, without preaching or scolding, and helps us to see ourselves better. Content warnings: this show deals with issues of violence, suicide, and online harassment. It is rated 15+. Accessibility: The venue is unfortunately not wheelchair accessible, but accommodations can be made if help is needed with mobility aids. The venue is an easy walk from public transport and there is free parking on the surrounding streets. The venue is also outdoors, so dress for the weather. 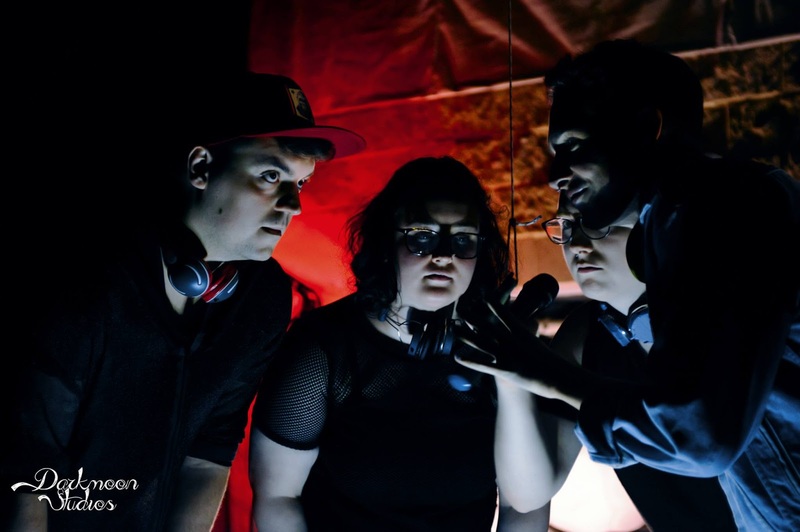 Magnetic North Theatre Company will be performing Puck at the Hidden Garden in Bardon (address given when you book) May 10-12 and 17-19 at 7pm. Read more and book tickets on the event page. Review of May 17 performance.